Today I have the lovely Rebecca, Feature Sponsor of February here sharing some wonderful inspirational quotes for your Saturday. Enjoy! My name is Rebecca and to my friends I'm know as LuckyRainbowDesigns. LuckyRainbowDesigns is my little space of the internet wher I love to blog, capture pretty instagrams, tweet, hang out on Etsy & Facebook and lately make mini films with the help of Vine. I created & set up LuckyRainbowDesigns in 2009 in a response to the lack of pretty handmade cards available in Ireland. I found myself looking for a special card for a friend for family member and fount that they were overprices & lacking in imagination and so LuckyRainbowDesigns was born. A huge part of my creative process is blogging. I particularly enjoy connecting with many talented bloggers from all over the world, reading their daily thoughts, tutorials, and advice and just generally spending free time drooling over beautiful blog designs. A popular post on my blog is the Positive Quotes series. I am someone who enjoys a daily hit of inspiration when motivation is low to encourage or push me further and by sharing inspiring and positive quotes I've gradually noticed that I'm not alone. Positive Quotes are hugely popular with many of you out there and while they may not be everyone's cup of tea, they certainly add that little something to my day or life and genrally provide me with a new way of seeing, doing or learning. Below are some of my very favourite quotes (all of which have been pinned to my Positive Quotes Pinterest board, so feel free to share!) and I've outlined the reasons why I love them so! As an Irish gal living in Ireland, tea is a staple part of our diets over here! 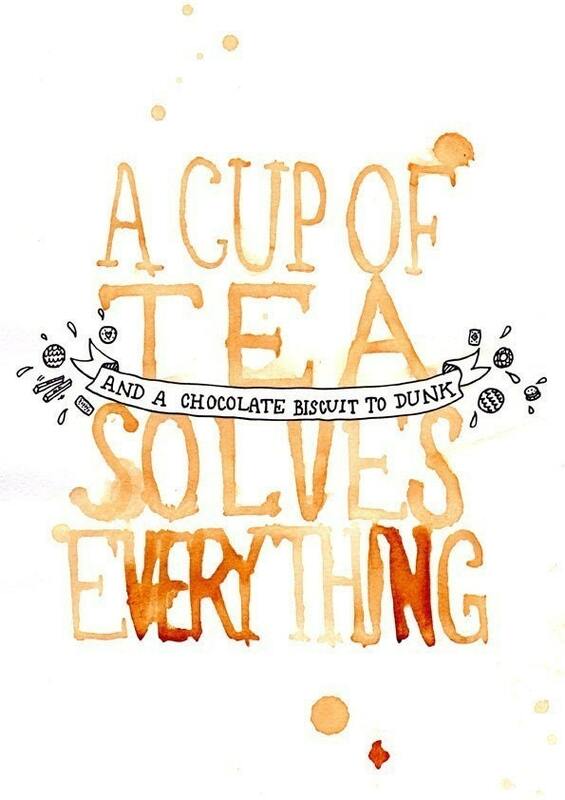 We have a saying that ‘a cup of tea fixes everything’ and generally if I am being consumed by thoughts, I like to sit down, write them on some pretty paper and indulge in a cup of tea with a biscuit or ten! I’ve met so many people in my 30 years who like to compare their lives to others either near them or in far reached lands. We like to think that the grass is always greener, but sometimes we don’t stop to think how comparing our life to others leads to disappointment or unhappiness in our own. This quote reminds me to be grateful what I have, to live in the present moment and quite simply, enjoy! I am, without a doubt, a glass half full person and cannot abide those who chose to live a negative life, who see the worse, rather than best in people and are glum people. Sitting around believe nothing nice will ever happen will of course not lead to nice things happening. The universe rewards positive thoughts and hard work and you have to….have to believe that something wonderful is about to happen and is quite literally around the corner! 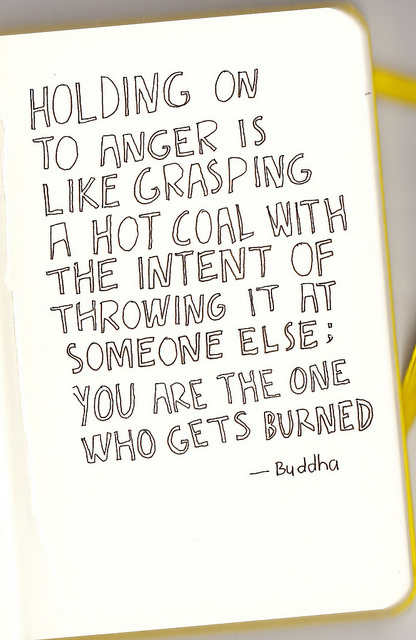 This quote could not ring more true and I’ve personally seen through friends or family members how holding on to anger hurts no one but the person holding on to it. It’s a waste or energy, time and your life, so let it go. If you’re that person, stop now, relax, let it go and move on. Your time can be better spent. Dream big! Don’t dream small, tiny or insignificantly! Dream big, huge, and even colossal. You never know where it might lead you! Aren't those quotes awesome? Please follow her Positive Quotes board, pop by her blog, & give her a shout out on Twitter! If you'd like to be next months' feature sponsor, visit the Advertise page or shoot me an email! I bet you, this app will surely make a difference in your life to some extent.